Indian External Affairs minister Sushma Swaraj (C) arrives at Tribhuwan International Airport, Kathmandu, Nepal, Feb. 1, 2018. India has signed a pact to build naval infrastructure in the Indian Ocean archipelago of Seychelles to counter growing Chinese influence in the region. The Indian foreign minister has also made an unusual visit to Nepal where Communist parties friendly with China are due to take power. Analysts said the two moves in the past week underline India's concerns about looming Chinese presence both in the Indian Ocean and in its immediate neighborhood. Under the agreement concluded last week with Seychelles, India would build an airstrip and a jetty for its navy on Assumption Island. The base will help firm up its presence in the Indian Ocean and extend the reach of India's navy by allowing it to rotate its ships and aircraft through the islands. "Relations with countries in the Indian Ocean Region and nurturing a climate of peace and stability are important cornerstones of India's foreign policy," Indian foreign secretary, Subramaniam Jaishankar said after sealing the pact, which was renegotiated on the basis of an earlier deal signed in 2015. India's quest for strategic bases overseas comes amid intensified worries about being encircled by an increasingly assertive China. 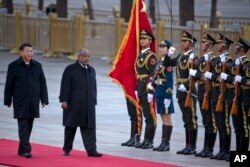 FILE - Djibouti's President Ismail Omar Guelleh (2nd-L) walks with Chinese President Xi Jinping during a welcome ceremony held outside the Great Hall of the People in Beijing, China, Nov. 23, 2017. Beijing formally opened its first overseas military base in Djibouti in East Africa last August. A greater concern, say analysts, is that Chinese assets are beginning to ring India in countries such as Bangladesh, Myanmar, Maldives and Sri Lanka that have signed on to Beijing's ambitious Belt and Road Initiative (BRI). "What we have got in our midst is a constriction of the Indian strategic maneuver space within our own geographical area," says Director of National Maritime Foundation in New Delhi, Pradeep Chauhan. "As China begins to develop bases in the Indian Ocean, there is a higher risk of this competition turning into areas of conflict." Although some of the projects under the BRI have recently been cancelled or are being renegotiated due to fears of tough financial terms, it has not allayed concerns in India, which worries that a region that needs billions of dollars in infrastructure investment will not be able to resist the lure of Chinese investments. "The real problem is of money and resources which all these countries want. There are aspirations which have gone up. Everybody wants to modernize and why not? And the Chinese are willing to offer money to them," points out Sukh Deo Muni, a South Asia expert at the Indian Institute of Defense Studies and Analyses. And the worry is that the economic presence leads to a strategic presence "because they are using infrastructure projects for strategic purposes." FILE - Chinese structures are pictured on the disputed Spratlys island in South China Sea, April 21, 2017. India's insecurities about Beijing's looming presence in the Indian Ocean and in its neighborhood stem from China's assertive behavior in the South China Sea, where it has conflicts with several countries such as Vietnam, Japan and Philippines. These concerns intensified after Beijing refused to accept the results of an international tribunal in 2016 over territorial claims in the South China Sea. "That undermines the entire fabric of international law," says Chauhan. The growing economies of Asia have made the Indian Ocean a hugely strategic region for countries like India and China with a bulk of their trade and crude oil imports traveling over these waters. India's concerns about Beijing's growing political clout in neighboring Nepal also prompted Indian foreign minister Sushma Swaraj to visit Kathmandu days before an alliance of Communist parties is set to takes power. The alliance, backed by China, won a landslide victory in elections held in December. Swaraj's visit on Thursday and Friday is seen as New Delhi's outreach to Nepali leader Khadga Pradad Oli who is expected to head the new government. "It [Swaraj's visit] speaks, it reflects a nervousness. That should have been done after he assumes the prime ministership," said Muni, pointing out that the visit would usually take place after the new government takes power. Relations between the two countries had hit a low point during Oli's previous stint as Nepal's prime minister in 2015. Accusing New Delhi of imposing an economic blockade on the country, he had built friendly ties with China in a bid to reduce the landlocked country's dependence on India. China has pledged about $8 billion in investments in Nepal and has promised rail links between the two countries. In the run up to the election, Oli also promised to revisit the previous government's decision to scrap a $2. 5 billion dollar contract with China for a hydroelectricity project. While India has also reached out to help small, neighboring countries like Nepal, Bhutan and Bangladesh develop infrastructure projects such as dams and roads, it is unable to match Chinese resources and is often accused of moving too slowly to implement the projects.